To research, you need to build a Research Lab. This building is available at all levels and has no building level itself. In the Research Ship section, you can add ship construction plans to your factories. If you won a ship construction plan in a PVE Mission, or got it from another player, you can drop it in this section of the research lab. Your researchers will then analyze the ship construction plan and when they're finished, you can build the corresponding ship in the factory of the right level. This feature of the research lab is location- and player bound. 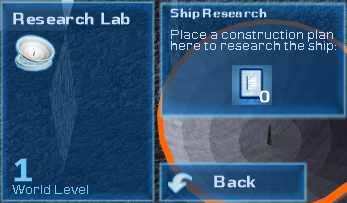 This means, when you research a ship construction plan, you can't research another one in parallel without using a different research lab. Other players can research their ship construction plans in parallel to yours, but only one at a time as well. If you don't want to find so much material to research an alien aspect, or you want more alien materials to create your own stations out of it, you can multiply material for some money here. The price depends on the material type. Just drop an alien material block and some money in the according recipe of the Multiply Materials section of the research lab. When the progress is finished, you can take the multiplied block from the output slot of the recipe. This works exactly like the Foundry. This feature of the research lab is location bound. This means, a multiplication process (and the present items in the ingredient and output slots) is visible to all players at one research lab. In this section, you can research the alien aspects in order to advance the technology level of your world. There are four races. To research the aspect of one alien race, you need to find the required amount of alien material blocks and add it to the item slots in the research lab. As soon as you gathered all material blocks and money for an alien aspect, this aspect will be researched. When the research (30:00 minutes) is finished, this will unlock all block types of that race in the Ship Designer of the current world level. In other words: Researching alien aspects allows you to build alien ships. When all four alien aspects have been researched, the World Level will automatically increase. This allows you to build buildings (and ships) of the higher level. The four alien technologies will remain unlocked for the previous level factories, but need to be researched for the new level again. This feature of the Research Lab is global. This means, every player can bring their material and money to any research lab, they all have the same state of alien aspect research. This page was last modified on 4 November 2017, at 16:53.